Meanwhile, I still have a few articles that I’d like to show you, such as this one that we’ve created during our stay in Shanghai with Montblanc. It was our second time staying at the Peninsula hotel near the Bund and since we had a little bit of free time on the day after our arrival, we decided to wake up super early and explore the neighborhood. I have to say, something about it definitely reminded me of some elements I’ve encountered while I was in India. Out and about with my Hermès bag around the Peninsula where it’s literally a Chanel, Vuitton and Fendi parade. But heading away from the hotel, even if only for 5 minutes, it was a completely different scenery. The contrast was pretty imposant. From incredible luxury, we were now lost in between two completely different areas of the city, each one of them something like 2 minutes away from each other. I have to say, at first, I felt a little uncomfortable and confused, especially because I was dressed up that way and obviously because people were staring. But then I realized that most of them were smiling at me, more curious than anything. 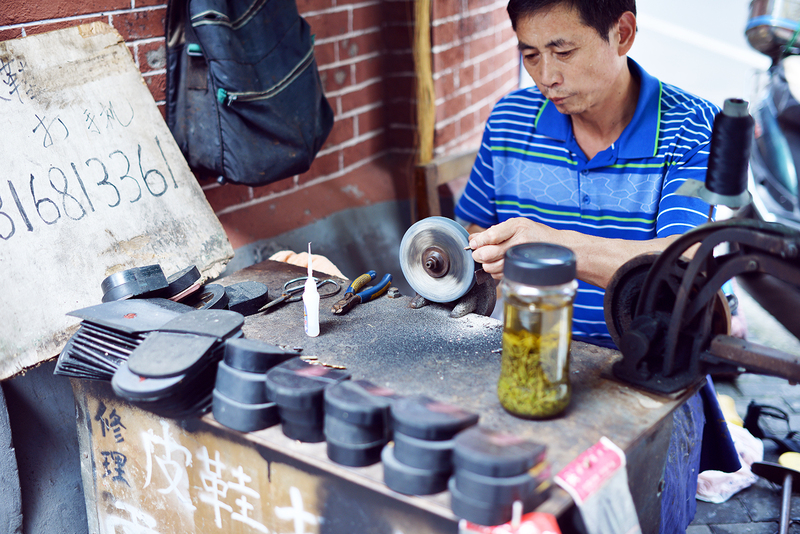 So many artisans were working in the streets, people everywhere walking to an up-beat rythme. 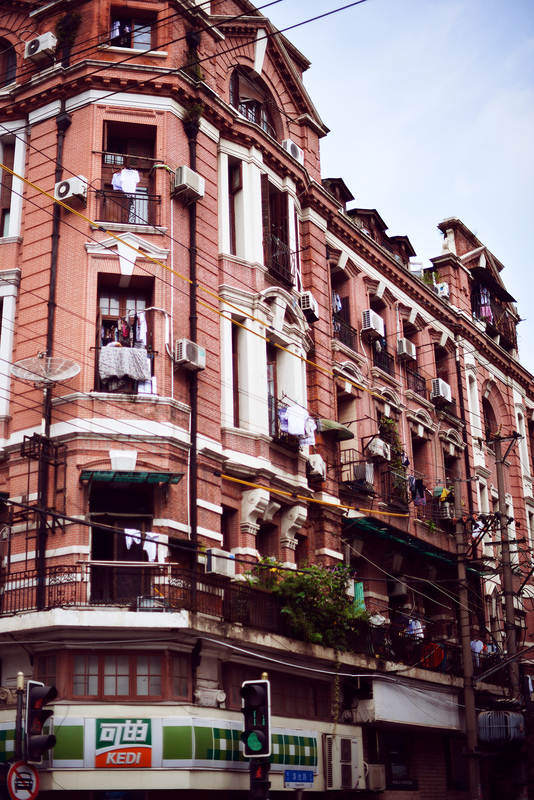 Shanghai is a city that lives. Everything is so bold and vivid. This energy is definitely contagious. It felt like a breath of fresh air to me. That morning when we woke up, I went for a super casual look that I showed you previously and then changed when seing all the girls dressed up in such a chic, fancy way while strolling on the Bund. Guys, I tell you, Dior bags everywhere. And it was way too hot for jeans. So I decided to switch up for this black and white look, Alexander Wang heels and this beauty of a Hermès bag for the rest of the day. I have to say, I am absolutely obsessed with it, it’s so timeless and iconic. Hope you guys enjoy! Amazing shoot !! You re so beautiful ! I love that shirt connected with leather shorts! Really great outfit! Simple black and white but so stylish! I LOVE this top! Amazing! I've truly enjoyed reading this post as well as looking at this amazingly stylish outfit. Those leather pants and wonderful Hermes bag are unbeatable! I'll be in Paris too for the Fashion Week, I hope to meet you there!! Can't wait to see and read about your coverage from Fashion Week. Love this monochrome look! Great simple outfit! Ahah i can see the smallest china people than you in your photos! Are you very tall or are they very very small ? Great style! Very interesting black&white combination! Beautiful shots as always. I need those shoes in my life! Love this out, so chic. Love this outfit, as usual! So impatient to see the fashion weeks through your eyes. I love this Hermès bag so so much, you look gorgeous Kristina! Can't wait to see more of your looks! Great pics! I am glad you like my hometown - shanghai! Nice outfit, like that bag so much! Wow, awesome pictures! The heels are just perfect! Kristina, you look beautiful and I enjoyed reading as always but please take this seriously and eat a little bit more!!! You look so thin as if the next gust of wind will overthrow you!!! I think you are now on the border of looking beautiful or just too thin. Too thin is when you can see all the bones up there just as in this post. Sorry but I think as a loyal reader I have to write it. Please eat a bit more, even if this is a stressful month!!! I reallly love the street look kind of photographer, so elegantly incorporated both style and daily lives. Love it!! Love your shorts and how you layer your necklace! Love the black leather with white silk and the bag is gorgeous! Beautiful outfit! Enjoy the fashion month! I can't wait to read your articles about it! Another gorgeous look! You look incredible, I loveee those heels! Thanks for sharing your stay! Amazing outfit! Love reading your blog! Love your bag and the photos are amazing as always! Kristina you are my moon , you are perfect :3 ..
gorgeous photos and gorgeous bag! Such amazing photography and I love your makeup! Can't wait for all your posts from NY fashion week! Love this look and the necklace - stunning!!!! I just love those shorts and the outfit is so simple yet chic. Lovely pictures. Perfect black and white look! Bag and shoes are amazing! love the outfit, and those shoes! Those shoes are incredible, I am such a big fan of Alexander Wang's designs! Great pictures! Love your casual outfits! They always look so special yet so chic! Love those shoes! Even though they have a pointed heel, there's something about them that looks so comfy! I went to China for the first time this year, and it was definitely a huge culture shock.but it's so interesting learning about how people love on the other side of the world. Amazing look Kristina. Love the black and white. It is so chic and classic and that it what I love at your style. I always think about to buying a leather short, because it is really trendy right know and you can style it so many ways. I did it and when I saw this post I was really happy that I have also a leather shorts now. Wish you a great sunday and a lot of fun at nyfw. I look at your Instagram all the time and you look so lovely in your outfits. Pretty Kristina. Love the leather shorts with the shirt and the sandals are fab! Have an amazing time at FW! I really like your articles and your fashion. Really good job. I can only say that you and James are very hard-working people, and that's why now you guys are knowable people in the fashion industry. Respect and good luck in future! You are amazing! Oh my god, that little Hermes treasure is simply pure perfection!! This outfit is gorgeous, I absolutely love the minimalistic white and black style at the moment and this looks so classy and chic. I bet it was amazing to explore Shanghai, places like that look so stunning and I hope wonder I can explore the places you have. I also cannot wait to see your fashion coverage, it must be so exciting knowing you get to visit all those different places! Great outfit, I love the heels! great outfit - and an amazing bag! All your looks are seriously so amazing! I'm following you on Instagram andy your trip looks so fun! Hi, i'm a reader from Brazil, i just wanna say you are one of the most beautiful woman i've ever seen hahaha really. An inspiration. Smart, and creative too. Love your photos! Well, your Wang heels are pretty amazing too ! Such a great look as always ! The bag is FLAWLESS! It looks so good, love the vibe of the photos! Can you please tell us us what lipstick you are wearing here? It is all perfection!